The best location in all of Copper Mountain! This penthouse level condo is peaceful, yet in the center of Copper’s most prestigious Village with beautiful views of the mountains,ice skating pond, and the bustle of the town. You will be able to relax in our sunroom while enjoying the views. Walk out the first floor doors, and you are less than 4 minutes away to the American Eagle lift, restaurants, and shops. At 900sqft, this is one of the largest one bedroom condos in Copper and is larger than most 2 bedroom units. As you walk into the Great Room with its huge views thru the Sunroom, kick back on the overstuffed couches and watch all the activities going on, all with the backdrop of the great Rocky Mountains. The spacious kitchen is loaded with appliances and amenities to whip up a quick ski-morning breakfast or a gourmet dinner. Even the master bedroom will blow you away with its private balcony and cozy surroundings. After a day on the slopes, drop by one of the many apres-ski locations such as Jacks, or Endo's Cafe, McGillicuddy's Irish Pub, all on the way back to the condo. Once back at your mountain home, turn on the gas fireplace and relax with music or enjoy the over 150 channels on the wifi enabled TV. Oh, don’t feel like cooking dinner? Call ‘Room-Service’ and have one of the many great restaurants in Copper Mountain deliver dinner right to you. Live Check in staff at the front desk and 24hr assistance available…… Don’t gamble with having a lockbox code emailed to you or an owner 1000 miles away…. Get the scoop on local activities from our friendly Check In staff. 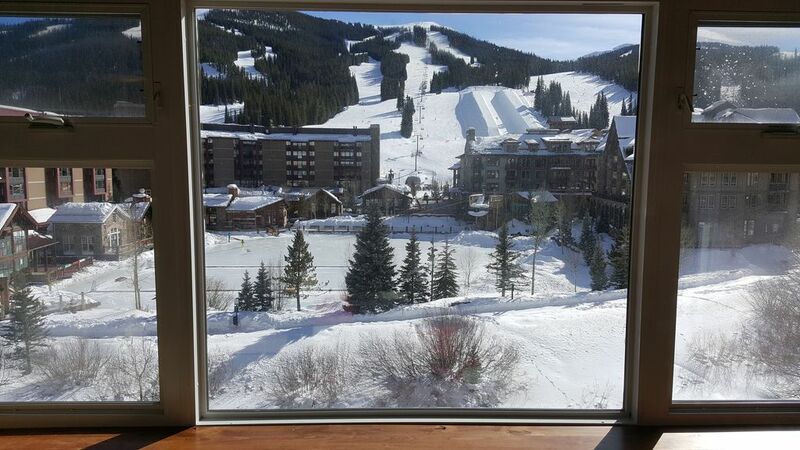 We are from Dallas and love spending the winters in Copper Mountain! The large size of this property makes it feel more like a home, than a hotel room. Every seat in the living room and dining area offers fantastic views of Center Village and the beautiful Mountains and slopes. Please note, our housekeeping team removes all leftover items after each stay. Fully loaded, coffee maker, Crock Pot, Blender, etc. Condo did not meet expectations - renter beware! The things we liked - the view is beautiful, the main room and bedroom are nice-sized, the vaulted ceilings, and the shower tile/tub is updated. It has potential. Just not as it is right now. So here are the numerous issues with this condo and building. The Building - it is older and definitely needs repairs and updates. The garage entrance is only 6'8" so beware that you have to park outside if your vehicle is taller or if you have a roof rack storage. During our stay, the hot water went out as there was a boiler issue with the building. They fixed it the next day, but we couldn't shower that day after skiing. The hot tub and sauna are older and were not very hot. This building is not "steps away from the slopes". It is about a 3-5 minute walk to the lifts, which isn't bad, but definitely not what I would consider as "steps". The condo - it is older and definitely needs upgrades. If you are wanting a new, clean condo, then this is not the one for you. *The carpet was stained, the bedroom blanket and comforter were stained, the bathroom mats were dirty, and the kitchen counter grout was very dirty. *The bathroom sink would not drain, so I had to call the management company to get it cleared out. They were responsive and corrected the issue within a day. *There are no window coverings in the main room. There were bright lights blaring from outside until at least 10pm each night. The windows desperately need coverings for those that are sleeping in that room. *The kitchen cabinets are in horrible shape - most of them do not open/close properly. I tried to open them to see what was inside, but I was so frustrated, that I gave up looking. *It seems there is a relatively new fridge and oven/stove, although we were so disgusted by the condition of the condo in general, that we chose to either eat out or eat at our friend's much nicer condo instead. *The light over the table flickers when the dimmer switch is used. *Didn't even bother using the fireplace due to other reviews. I brought these issues to the owner's attention and she replied that they were out of her control (building or management issues). She offered us a partial refund to vacate the unit that day, but it wasn't prorated to the total trip cost and I wouldn't have been able to find another place over spring break. She did not respond to my other messages nor ever apologize for the things that were in her control, like her actual condo. I recommend finding a different condo. 1. The owner's description of the property stated that a complimentary pool was available. This is not the case. For a per person per use fee, you can use the pool at the Athletic club. 2. The condo in general is in need of maintenance. The kitchen cabinet doors are loose, difficult to close fully and have the appearance of nearly falling off. Some of the tiles on the kitchen countertops are missing or are chipped off. The carpet is stained throughout. 3. The gas fireplace covering started to fall off with the kids sitting next to it while the fire was on. My 11 year old had the piece of mind to use her brother's ski pants that were on the ground (so as not to burn her hand) to push it back in and keep it from falling, but the pants were ruined. 4. The building management (Buffalo Mountain Management) is very aggressive in their review of parking to the point of harassment. We had our parking permit on the dashboard, but it fell onto the passenger seat but was in plain view regardless. Within a 12 hour time period, management had put a giant orange sticker on the driver's side window threatening to tow our car. I had to go get razor blades and "goo" remover to get rid of the sticker before I could safely see out of the window so that we could leave. The building management never returned my call. In general, it is a nice space that could use some TLC, and I could do without the harassment of the building management and feel that issues such as the fireplace need attention. The owner was very nice. If we have any question we can always message them and they're very quick to respond. Check-in and check-out process was so easy and inconvenience. The place was very neat, cozy and inviting. We highly recommend this place! Location is great! Very close to the ski slope. Place could get some upgrades, it is really outdated. Fantastic view of West Lake and the skating rink, with easy access to center village, the slopes, and restaurants. Extremely spacious for a one-bedroom. This Home Away was great. It was only a few minute walk from everything in copper mountain. It was clean and more spacious than I had anticipated. There is a beautiful little room attached to the living room that is great for just sitting there and looking at the mountain. The building had an awesome hot tub area, and two saunas. One for men, and one for women. I didn't expect those amenities. Over all, a fantastic place and will definitely try to stay there next time I go back.